Adworkz, Inc announces their suite of digital products designed to maximize effectiveness and revenue at auto dealerships nationwide. MakeItMyAuto.com is the flagship app in their product suite. Designed as a simple and easy way for car dealers to boost accessory sales, MakeItMyAuto allows car buyers to choose accessory options on a digital device, while waiting for paperwork to be processed. Auto buyers can see the most popular accessory options available for their new car, and see how various configurations will change their payments. Engagement levels are higher, customers perceive a shorter wait time, and auto accessory sales improve. 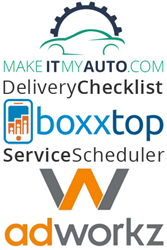 Delivery Checklist digitizes the sales process for new vehicles. With manufacturer-specific checklists and integrated email delivery of docs, Delivery Checklist streamlines the new car sales process, and with full back-end analytics, allows for salesperson performance tracking. In addition, the first service scheduling module helps lock in customers for life. On average, dealers see service retention rates of 30-40% with first-time buyers. With Delivery Checklist, dealerships are seeing service retention rates of 90% or more. Service Scheduler allows customers to easily schedule service appointments from their desktop or mobile devices. Fully integrated with Delivery Checklist, Service Scheduler works alongside existing DMS systems and BDCs - with automated email and text reminders to reduce no-shows. It includes real time stats and analytics reporting built-in to the backend dashboard. boxxtop.com is a digital coupon app that allows promotions to be shared directly to a customer’s phone. Coupons can be an effective way to gain and retain customers. For auto dealerships, the possibilities are nearly endless, from oil changes to various automotive services, specials and flash sales - digital coupons coupled with geo-targeting are a new marketing frontier. State of the art geo-location settings alert customers with push notifications when they are near a business running a promotion, which means these digital coupons can easily be turned into sales. Promotions can also be shared directly to social channels like: Facebook, Twitter, etc. - generating not only new business, but also social buzz. Come visit us at: NADA, 2016 - booth 3357c.